“With A Splash of…” is my first e-book! 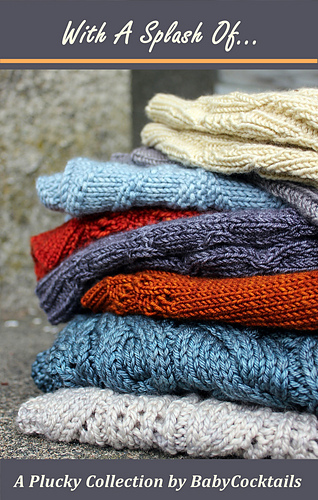 A collection of 7 different accessory patterns, using some of my favorite Plucky Knitter yarns. Soft cream, delicate grays, bold reds, and clear blues signal the change of the season in a mix of cables, lace and ribbing. Like the mixers they are named for, these great basics will top off any outfit with just what it needs. I tried to mix it up, adding in both simple stockinette and a few things that require a little thought, but nothing in here is too advanced, and knitters of all levels should be able to tackle these. All the designs use 1-3 skeins and will be both quick to knit and easy on the budget. Plus, who doesn’t need a little instant gratification before sweater weather hits and the leaves begin to turn?